It’s hard to let go of the past, even when it’s holding things together. I put a garage door up several weeks ago. The garage I was working on was a little one car garage with an overhead door on the front and nothing more. No windows, no passage door. The old door on the garage was running fine, but the panels were coming apart and it became futile to paint the door again. My customer picked out another wooden door, with windows, similar to the one we were replacing but with fresh track and a torsion spring instead of stretch springs. I was glad about that, stretch springs make me crazy. I installed the door on a pretty cold day, but it was not snowing and garage doors are cold weather friendly work. I spread out the parts, sorted the hardware and assembled the panels for stacking. I cut a zany scribe strip across the threshold area, the garage had been moved at least twice and the floor was a pattern of triangles and humps of concrete. The bottom panel work was tricky but par for the course in an old garage. The garage had a little lean to it, the customer understood the new door would show the slight lack of plumb when installed, she was fine, she’s an old house kind of person. She likes things done really nicely, does not seek perfection, and, embraces character. Lucky for me and the garage. Then came the funny part. Square head nuts, bolts and lag bolts. All over the old garage door and track. This door’s been around a while. Taking most doors down is pretty quick. I utilize a good electric impact gun and a sawzall. Taking the nuts and bolts out in the correct order using the electric impact gun and the door practically falls into a pile ready for disposal. If it’s a 16′ wide door, the sawzall comes out. Since quite a few of us don’t have impact socket sets for square head nuts and bolts the process changes pace. Vice grips replace sockets and it takes a little more focus. One at a time, hand work with no motor speed. The old garage door came down, comically slow compared to other things going on. Sort lumber from steel for disposal and recycle. The new door stacked right into the opening on it’s fresh bottom panel scribe. I wound the torsion spring carefully, and attached the overhead operator. Smooth quiet and solid sounding. I went back this week since the weather warmed and oil primed and painted the wooden door. It got even quieter with three coats of paint and some caulk. I also installed a wireless keypad for the customer. It’s a great door, all wood, matches the old one so even the Landmarks Commission is happy. Easy sneezy, out of sight out of mind. Not really. Those square head bolts make me think. They resist today’s tools, they shrug away speed with their simplicity. They command consideration. They won’t come out of that lumber without a reminder of days gone by, tools no longer sold except in antique shops and specialty catalogues. I’ve always had a hard time throwing those square bolts in the scrap. 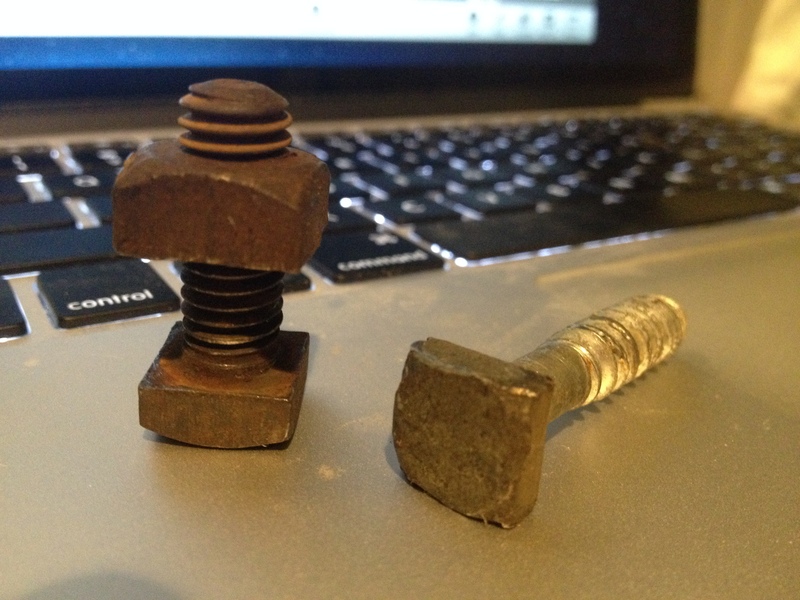 I’m already seeing fasteners used that are barely recognizable to what I’m used to, things change. It’s a gift to watch the past slip through my hands into history while I build today’s evidence to be considered by future workers. This job really never gets old.